The recommended usage of 2 capsules daily (see next tab) delivers a similar amount of the active ingredients as to the tincture. At this usage level you get almost 50% extra active ingredients with no increase in cost. In 1960, German scientists identified a group of active ingredients collectively called Silymarin present in Milk Thistle. Silymarin protects the liver by strengthening the outer membranes of the liver cells, which prevents toxins from entering the cells. Silymarin also stimulates protein synthesis in liver cells, which helps to regenerate and repair the liver. Silymarin compounds are also strong antioxidants, and have been shown to reduce damage to liver cells caused by repeated use of some prescription drugs. They help to protect the liver from alcohol damage, cirrhosis, hepatitis, and pollutants. 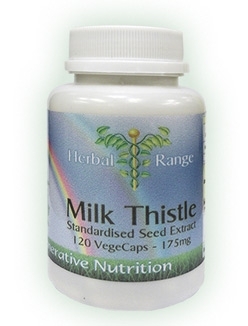 Milk Thistle is an herbaceous annual or biennial plant with a dense prickly flower head with purplish tubular flowers. Milk Thistle is an edible plant native to southern Europe, southern Russia, Asia Minor, and northern Africa, and has been used for food and as a tonic herb for the liver in the countries surrounding the Mediterranean for a long time. Virtually all parts of the plant have been used as food with no known toxicity. Milk Thistle was introduced to North America by European colonists. The liver is an overworked organ that detoxifies blood and performs numerous vital functions. 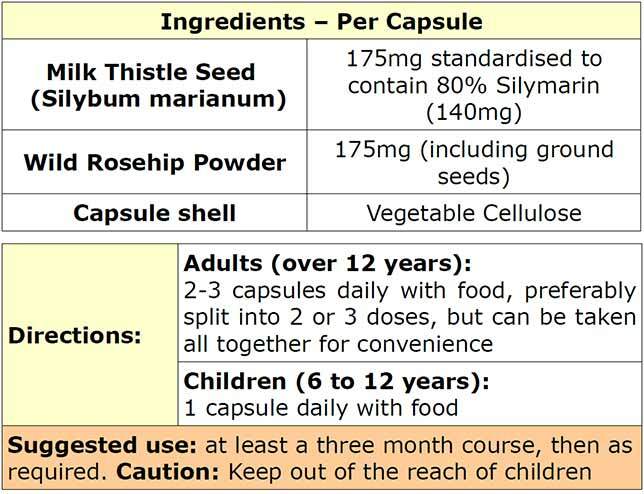 Milk thistle (Silybum marianum) is an edible herbaceous annual or biennial plant native to warm, dry areas in southern Europe and northern Africa, and has been used as food in the countries surrounding the Mediterranean. Milk thistle has been used for liver problems for over 2,000 years. In 1960, German scientists identified a group of active ingredients collectively called silymarin from Milk Thistle, mainly from the seeds. Silymarin protects the liver by strengthening the outer membranes of liver cells, which prevents toxins from entering the cells. Silymarin also stimulates protein synthesis in liver cells, which helps to regenerate and repair the liver. Silymarin compounds are also strong antioxidants, and have been shown to reduce damage to liver cells caused by repeated use of some prescription drugs. They may protect liver from alcohol damage, cirrhosis, hepatitis, and pollutants. Recent studies have shown that Milk thistle extract may also be beneficial for reducing the chance for certain cancers. With almost no known side effects, since Milk Thistle is a food, and well-known hepatoprotective efficacy, it is said that Milk Thistle is the best liver protector of the herbal kingdom. 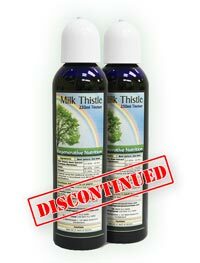 The German Commission approved the internal use of crude milk thistle fruit preparations for dyspeptic complaints. Standardized extracts (usually ranging in silymarin concentration from 70 to 80%) are approved for toxic liver damage and as a supportive treatment for chronic inflammatory liver disease and hepatic cirrhosis. Silymarin is known to protect the liver by altering and strengthening the structure of outer cell membranes of liver cells, preventing toxins from entering the liver cells, and by stimulating the regenerative ability of the liver and the formation of new cells through the activation of an enzyme nucleolar polymerase A, which leads to the increase in ribosomal protein synthesis and cell division. The silybin component of sillymarin has been related to cholesterol-lowering effects. Through the capability to increase bile solubility, sylimarin may also help prevent or alleviate gallstones.